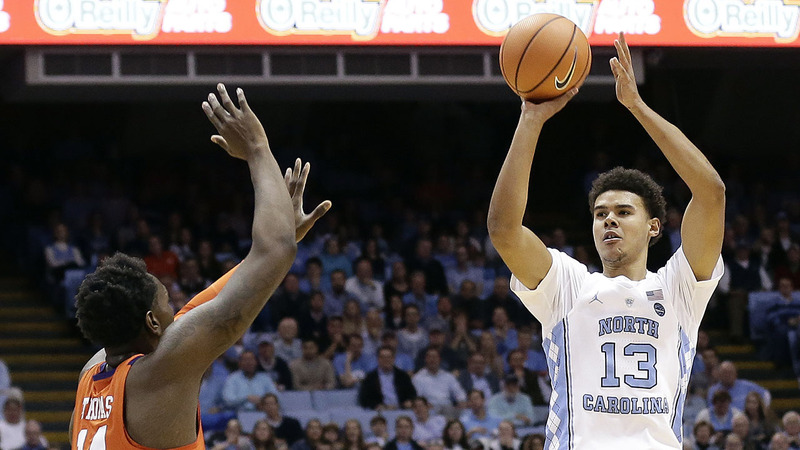 CHAPEL HILL, NC -- Cameron Johnson never let himself fret about the outside shot that had seemingly abandoned him in his brief North Carolina career. It's a big reason why the 15th-ranked Tar Heels still have their unblemished all-time home record against Clemson. The Pittsburgh graduate transfer broke loose for a season-high 21 points, helping UNC hold off the 20th-ranked Tigers 87-79 on Tuesday night to improve to 59-0 at home in the series. Johnson's outside shooting was one of the biggest reasons he was considered such a key offseason addition for the reigning national champions, but he had made just 31 percent of his 3s since his debut Dec. 20 against Wofford. He made 7 of 10 shots and 6 of 9 3s against the Tigers - and the Tar Heels (15-4, 4-2 Atlantic Coast Conference) sure needed them all. UNC coach Roy Williams said it wasn't as easy as it looked. "It just fell today. Sometimes it happens," Johnson said. "I try not to worry about missed shots because it happens to the best of them, the best 3-point shooters shoot in the mid-40s (percentage). You've just got to keep going. You've just got to stay in the gym and not get down and try not to think about it, and just let it go." In the end, UNC hung on despite seeing most of an 18-point lead erased by Clemson's torrid second-half shooting. "I told the guys I started the season at (age) 67," coach Roy Williams said, "I'm going to end the season at 97." North Carolina's Kenny Williams defends as Clemson's Marcquise Reed loses control of the ball Tuesday. Marcquise Reed scored 21 points for the Tigers (15-3, 4-2), who missed their first shot of the second half and didn't miss again for nearly 11 minutes. That run of 15 straight made baskets changed the dynamic of what was heading for an oh-so-routine home win for UNC against Clemson. The Tigers thrice closed within two points in the final 10 minutes but no closer, cooling off to make just 4 of their last 15 shots. UNC, meanwhile, shot 65 percent after halftime. "The way they shoot the ball now, I think it's one of their better shooting teams, and we were certainly worried about that," Clemson coach Brad Brownell said, adding: "There's a lot of guys to cover, and because of that, it's hard to cover them all." Clemson: Year after year, the Tigers have faced the question of what it would take to end its unprecedented losing streak here. Tuesday looked to be as good of a chance as any, with this being the first meeting here with both teams ranked in the AP Top 25 since January 2009. But Clemson got a bad start and spent the rest of the night playing catch-up. "I think we got caught up in the moment, really," guard Shelton Mitchell said. "Especially with us, how we haven't won here, I think we all got caught up in the moment. ... A lot of guys didn't have a good start, so I think once we started out, we kind of got in a slump and then we dug ourselves a hole way too deep." UNC: While the Tigers faced annual futility, the Tar Heels have long had the opposite issue - the pressure each time to ensure the streak doesn't end on that particular squad's watch. And that pressure could be felt in the Smith Center when the Tigers made their incredible second-half shooting surge to get back in it before the Tar Heels held on to make this game end just like all the others here. Luke Maye scored 11 points while playing with a stitched-up cut on the right side of his nose, an injury suffered shortly before halftime when he took an elbow from teammate Kenny Williams on a rebound. He came up with a couple of big baskets late, including a 3 with 4:50 left and UNC up 69-66. Maye said he needed five stitches and was tested for a concussion before returning. "I think it looks OK," Maye said of his cut. "I feel like I already have a girlfriend, so it's all good." UNC's 59-0 all-time home record against Clemson, including a 28-0 mark in the Smith Center, is the longest home winning streak against a single opponent in NCAA history. "Even though we play them again at their place, it was good just for them not to come in here and end that streak," said UNC's Joel Berry II, who had 14 of his 17 points after halftime. Clemson: The Tigers host Notre Dame on Saturday. UNC: The Tar Heels host Georgia Tech on Saturday.